This is the first of a series of articles reviewing this history of the Soviet Union, a state which has been subject to a great deal of political mythology from both its advocates and detractors. However in order to develop a correct political opinion analysis must be based on facts and with a sense of proportionality, and context. These are issues that are often overlooked by political partisans who are under the influence of selection and confirmation biases according to their ideology. Such errors are almost certain (except by luck) if one starts with ideological position and then seeks facts that support their position, and ignores those that don't. Inevitably such approaches will result in terrible errors if their advocates ever achieve power. History should be a resource for learning the benefits of previous actions and preventing the mistakes of failed policies. It is inevitable that one hundred years are the October Revolution (7 November, New Style) that there has been numerous reviews of that event and all that followed, although perhaps not as one may expect. The relative dearth of public debate of course comes down to the fact that the Soviet Union has not been on the world political map since December 1991. There is now more than an entire generation of people who have no living memory of the country. let alone the context of the country's existence, and memorial rallies in Russia itself were modest. A worthy historical effort was provided by Project 1917 which gives a good account of the revolution combining direct information from historical events in a modern style. From the classics it is hard to go past Leon Trotsky's History of the Russian Revolution for being an eye-witness and thorough account, and the eye-witness account of Menshevik Nikolai Sukhanov whose The Russian Revolution was originally published in seven-volumes. It is interesting to note that Sukhanov and Trotsky both share the honour of both being subject to show trails in the Soviet Union, and both were killed by agents of that State only a couple of months apart. The first thing that must be understood in recollection of the Soviet Union is the remarkable conditions under which it was formed and how unusual they were. Although starting with the largest land army in the First World War and with initial successes in Poland, Galicia, and Turkey, entrenchment in the west was matched with a massive redeployment by the German Empire in the eastern front. The German Imperial forces were able to force a strategic retreat (known as the Great Retreat) with significant losses to morale and troops. Less than a year later Brusilov launched a well-planned and initially successful massive offensive against the Austro-Hungarian Empire, albeit with enormous loss of life on both sides. It also encouraged Romania to enter the war on the side of the Entente - a decision that would prove costly for them in the coming months as the Central Powers invaded from multiple directions. (c.f., Norman Stone, The Eastern Front 1914–1917). Whilst rumblings against the autocratic and archaic Tsarist government had been prevalent for decades, most significantly Bloody Sunday and the failed revolution of 1905 which nevertheless ended the absolute monarchy in favour of a constitutional monarchy. (c.f., Abraham Ascher, The Revolution of 1905, three volumes, Stanford University Press, 1988, 1994, 2004), the addition of frustration with war losses and the resultant significant economic hardship, lead to an outbreak of mass demonstrations initiated by mainly women protesters on International Women's Day on 23 February (8 March New Style) in the capital, Petrograd, under the slogan "Bread and Peace". This February Revolution continued with several days of strikes and clashes with Russian police. On February 27 (March 12) Russian Army forces sided with the revolutionaries and three days Tsar Nicholas II abdicated, ending almost two hundred years of the Russian Empire, and almost four hundred years of Tsardom. In that sense it remains arguably the most important event of Russian history. A Provisional government was established initially under Prince Georgy Lvov, then from July onward by Alexander Kerensky. The Provisional government was a coalition of Kadets and Progressives (liberal parliamentarians), Socialist Revolutionary (mostly agrarian socialists and social democrats), Mensheviks, and a handful of others. As a moderate government in a radical circumstances it was challenged on the right by conservative supporters of the Tsardom and Empire, and on the left by the Bolsheviks. The latter had some particular influence in the Soviets, but even the Petrograd Soviet was largely controlled by moderates at the time of the February revolution. Between the Soviets and Provisional government a period of "dual power" (dvoevlastie) developed where both co-existed, to a degree worked together, and had competing claims to legitimacy. The Soviets had popular support, especially among the workers and soldiers (c.f., Petrograd Soviet Order No. 1), whereas the Provisional government carried out administrative functions and had some international recognition from the Entente and its allies (c.f, Paul Robert Browder, Aleksandr Fyodorovich Kerensky, "The Russian Provisional Government, 1917: documents", Stanford University Press, 1961), even if it found itself rearranging the makeup the government four times in its short life. Between February and September 1917, the Bolshevik faction of the Russian Social-Democratic and Labour Party, with a consistent anti-war position. increased from 24,000 to over 200,000 members, gaining a majority in Moscow, Petrograd, Minsk, Kiev, and other cities. With his return to Russia Lenin argued that workers through the Soviets should be the governing authority, encapsulated in the slogan "All power to the Soviets" (c.f., The Tasks of the Proletariat in the Present Revolution, Vladimir Ilyich Lenin, April 7, 1917 in Pravda No. 26). Their influence became obvious when they thwarted a coup attempt by General Lavr Kornilov, against the Provisional government, despite the fact the that the government had continued to support the war effort and had arrested numerous Bolshevik leaders following July Days protests. Almost completely openly, and with the support of the soldiers and workers, the Bolsheviks through the Petrograd Soviet prepared and then engaged in an armed insurrection in Petrograd on 25 October (7 November, New Style) 1917, occupying government buildings. 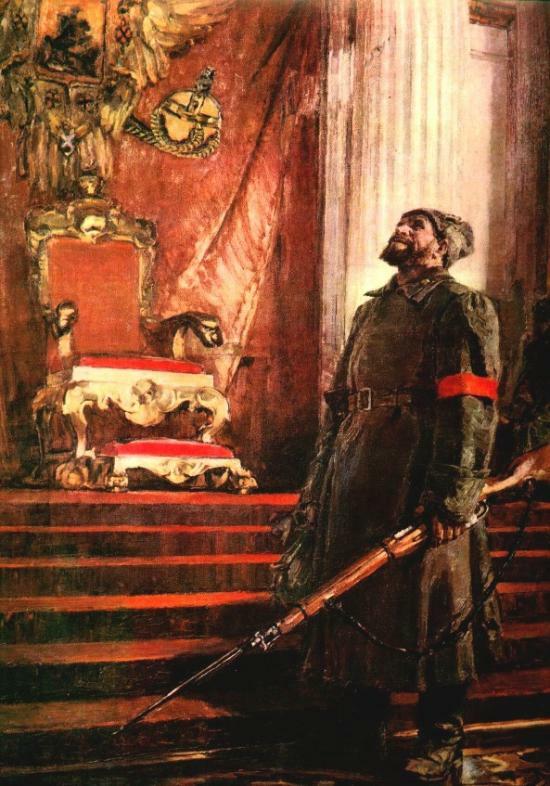 The following day they captured the Winter Palace, the seat of the Provisional government, with virtually no resistance - nearly all forces that had any loyalty to the Provisional government had already deserted. The actual October revolution, despite numerous propaganda efforts after the fact, was actually a relatively quiet affair. The bloodshed would occur later. The circumstances of the October Revolution were all objective contributing factors which allowed for an opportunistic seizure of power by the Bolshevik faction. "Revolutionary" groups in advanced capitalist countries who often express a romantic desire to achieve a similar sort of capture of the State machinery must realise that those conditions were rare, to the point of being unique. The State was controlled by an archaic absolute monarchy until 1906, and a limited constitutional monarchy after that. The monarch in question, Nikolai II, is poorly regarded by all historians, lurching from political and domestic crisis, to violent suppression of peasants and workers, and military defeats. The country was in nationalistic war which had dragged on for years with massive loss of life and infrastructure, resulting in extraordinary hardship and impoverishment among the population, and as a result had little popular support. Also, and whose political implications is usually overlooked, the front line of the war was at the time of the February and October revolutions was close to the Russian industrial and political heartland. It is here, where soldiers and workers were in close proximity, that the anti-war message of the Bolshevik faction had the most prominence and immediacy (it was not called the Petrograd Soviet of Workers' and Soldiers' Deputies for nothing!). The moderate Provisional government, which in times of peace may have prevailed, lacked support and legitimacy among these two groups even if it did have some unenthusiastic support among others. The lack of participation from the Bolsheviks from the outset, followed by their opposition from the April theses made the Provisional government's survival impossible. As Hannah Arendt astutely observed, when a government lacks legitimacy revolutionary forces win more by mass defection than conflict. The October Revolution was made possible by circumstances; seizing the opportunity made it an actuality. Commenting on this Story will be automatically closed on January 30, 2018.